Thanks to our partner, SAVI Industri A/S from Denmark – the top market share in U.S.A and UK for veneer guillotines, INNOVATOR’s Machinery is now able to manufacture veneer guillotines with original technology and know-how. CutMate series are also constructed with a view to the highest security of the operator without causing inconvenience to the working. All INNOVATOR’s guillotines are completely hydraulic on both knife and pack beam. The pressure of both knife and pack beam is adjustable. Various materials including veneers, paper, plastics and so on can be cut with the series. Coupled with INNOVATOR’s Double Sided Veneer Glue Applicator (GlueMate 700) & Crossfeed Veneer Splicer (UltiMate series), the perfect gluing and jointing result is accomplished with high production efficiency. 1. 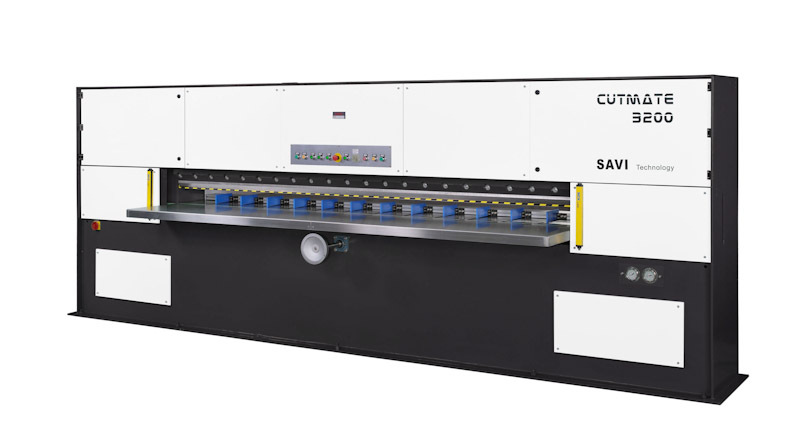 SECOND-CUT Technology for thick or especially hard species of veneers cutting available By switching knife beam to second-cut mode, a thin clip of approx. 1 mm is cut off from the veneer pack after the first trim. This unique feature which can only be found in all INNOVATOR’s guillotines is necessary when working with thick or especially hard species of veneers.